Post is brought to you by Horizon Organic. The recipes, images, text, video, and opinions expressed are my own. 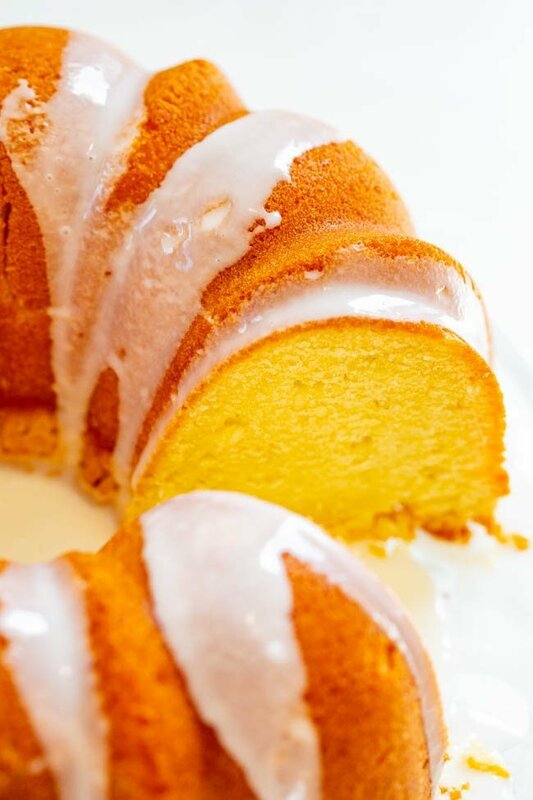 Easy Glazed Pound Cake – Finally a pound cake that isn’t dry!! This EASY, buttery, velvety pound cake will be the star of your next party or celebration! 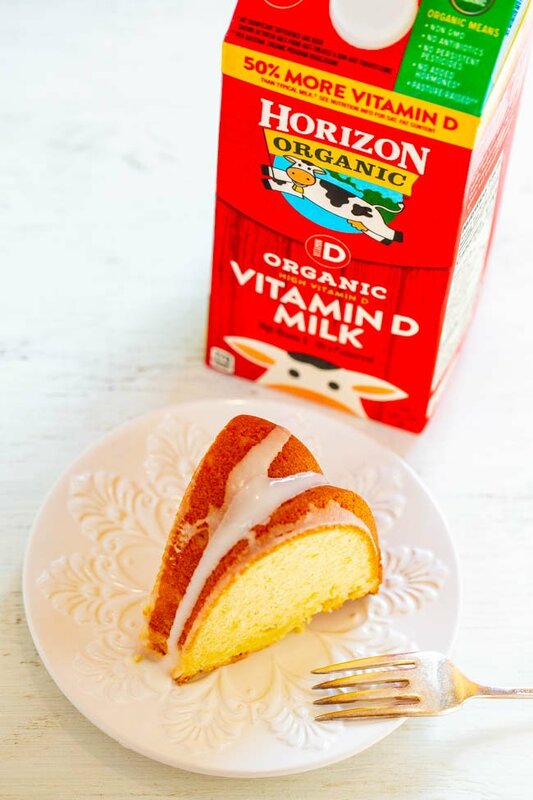 If you’re looking for that PERFECT pound cake recipe that also features Horizon Organic ingredients, this is the one!! There is a first for everything and after 10 years of blogging, this is the first pound cake recipe I’ve ever published. Why have I waited so long you may ask? The simple answer is that usually I find pound cakes to be dry and boring, but since this one is neither, it’s finally a recipe worth sharing. The pound cake has a tight crumb with a dense yet soft interior. It’s buttery, rich, and luxurious-tasting with a slight crispiness to the exterior. I made a simple glaze for the pound cake to dress it up a bit and make it pretty enough to serve at your next holiday party or celebration. This is one big and rich cake and will definitely feed a crowd of hungry friends and family. In times past, pound cakes were literally made with a pound each of butter, sugar, eggs, and flour. This recipe comes pretty darn close. There is indeed one pound of butter (4 sticks), over one pound of sugar, almost a pound worth of eggs, and nearly one pound of flour. If there’s ever a time for indulging in pound cake, ’tis the season. There is also one cup of Horizon Organic Whole Milk in the cake. It’s certified organic, meaning there are no GMOs, no antibiotics, no added hormones, no persistent pesticides, and the humane treatment of cows. It brings 50% more vitamin D than typical whole milk in every delicious serving. I’ve been a big fan of Horizon Organic Milk for years. Check out these Vanilla Bean Mini Muffins and Caramel Macchiato Copycat. It delivers the taste you can trust and is perfect for all your holiday baking needs. I used additional Horizon Organic Whole Milk to make the glaze. As a tip, you can also substitute the Horizon Organic Whole Milk for Horizon Organic Eggnog. It’s a seasonal item but if you’re feeling like making this into an eggnog pound cake, go for it. I used a mixture of vanilla and almond extracts for flavor. Not everyone has almond extract on hand or enjoys the flavor and if you’re in that camp, you can omit it and stick with just vanilla extract by adding an extra teaspoon. One thing I strive for in sharing recipes is to make them accessible and give different options based on what baking supplies and equipment you’re working with. I baked the pound cake in a 12-cup Bundt pan and had about 3/4 cup batter leftover and baked that in a mini loaf pan. The Bundt pan baked for 1 hour 15 minutes and the mini loaf pan baked for 47 minutes. If you have a 10-cup tube pan, that will hold all of the batter, I estimate it will take 1 hour 15 minutes to bake as well. 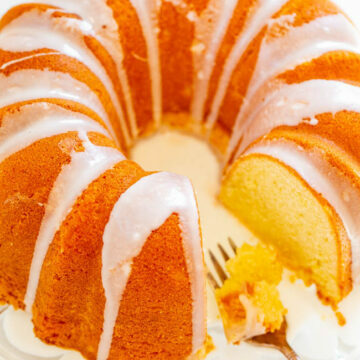 Pound cakes don’t rise quite as much as normal cake and so if you would normally fill a cake pan about 50-60% full, you can fill your pan to about 75% with the pound cake batter. A huge tip when baking pound cakes is to make sure you don’t overbake them or they will for sure turn out dry and crumbly. Light vs. dark-colored pans will also bake differently. As I always say, watch your cake and not the clock and bake until it’s done. Here’s a video demonstrating how I make the pound cake. 35 BEST Easy Cakes – Whether it’s a birthday cake, anniversary cake, or a just-because cake, you’ll find the perfect EASY cake here!! Only the BEST recipes including chocolate, fruity, pumpkin, red velvet, and more!! Easy Homemade Funfetti Bundt Cake – NO cake mix in this 100% HOMEMADE funfetti cake and it tastes amazing!! Fast, EASY, and the BEST scratch funfetti cake recipe that’s loaded with sprinkles!! 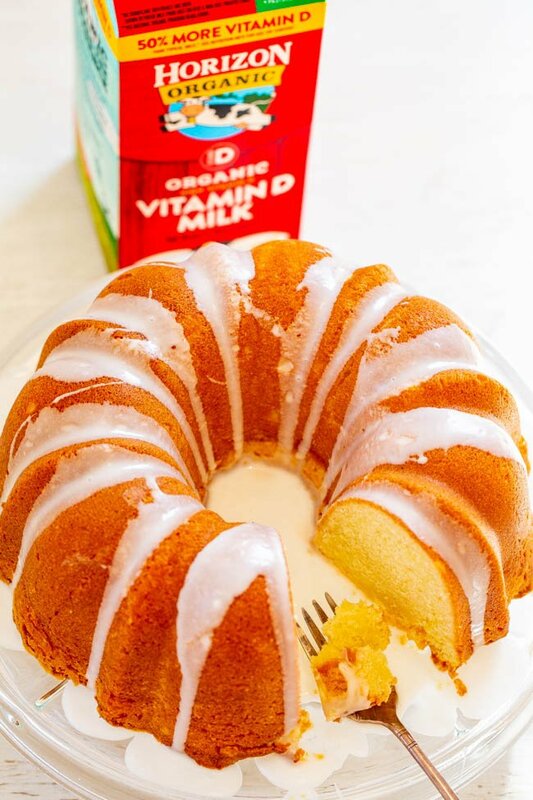 Easy Glazed Pound Cake – Finally a pound cake that isn’t dry!! This EASY, buttery, velvety pound cake will be the star of your next party or celebration! 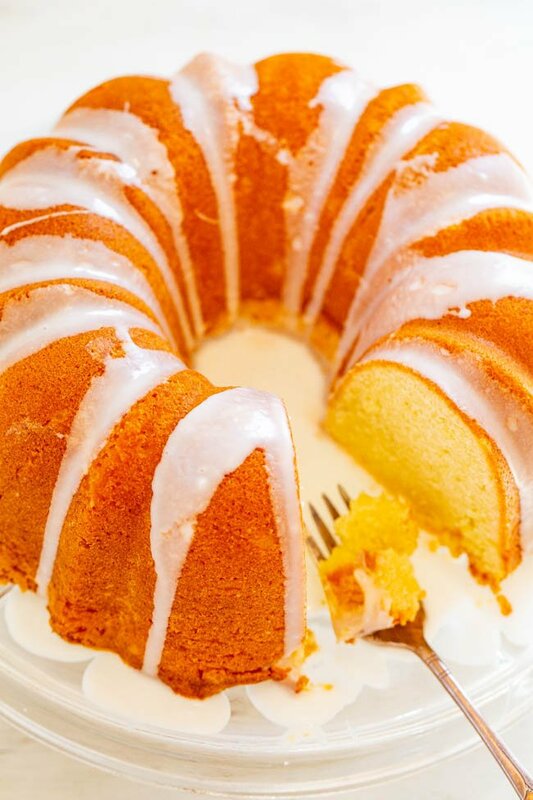 If you’re looking for that PERFECT pound cake recipe, this is the one!! 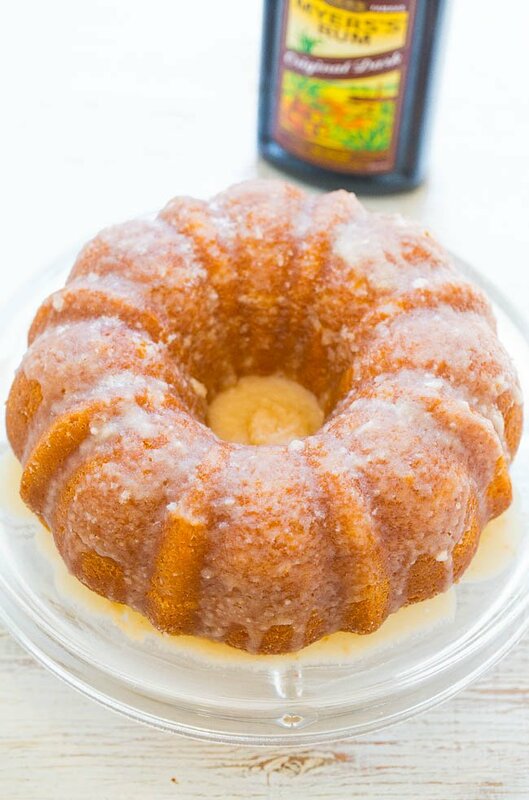 Pound Cake – Preheat oven to 325F and spray a 12-cup Bundt pan plus 1 mini loaf pan (for the excess batter) OR a 10-inch tube pan very well with floured cooking spray, or grease and flour the pan; set aside. To the bowl of a stand mixer fitted with the paddle attachment (or handheld electric mixer), add the butter and cream on medium-high speed until fluffy, about 2 minutes. Add the sugar and and beat until smooth and incorporated, about 2 minutes. Add the eggs, one at a time, beating well after each addition. Stop to scrape down the sides of the bowl as necessary. Add the flour and milk, alternately, while beating on medium-low speed to incorporate; don’t overmix. Add the salt, extracts, and beat until just combined. Turn batter out into prepared pans, smoothing the tops lightly with a spatula. 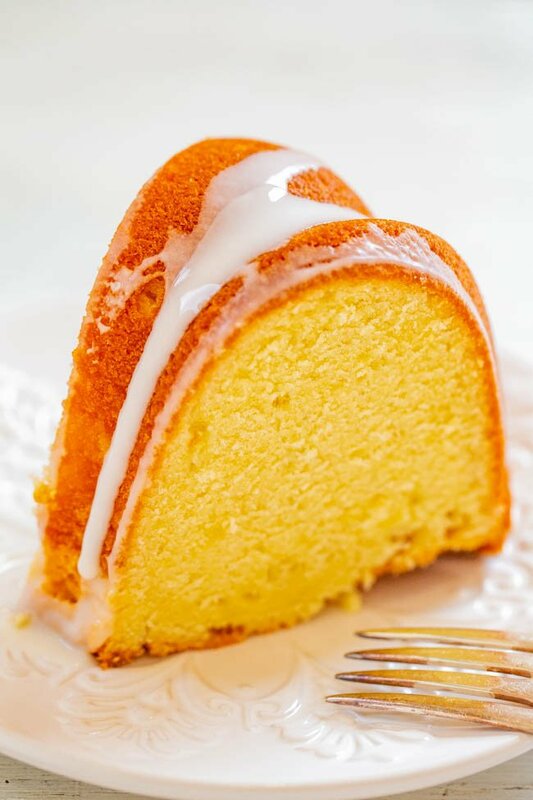 Note – this pound cake does not rise as much as a normal cake so if you would normally fill a cake pan about 50-60% full, you can fill to about 75% with the pound cake batter. Based on the types of pans you have, you may be able to fit it all in one pan or you may need to use a mini loaf pan for the excess, or you can simply discard the extra small amount of batter if it will not comfortably fit in your pan. Bake for about 1 hour 15 minutes (and I baked my mini loaf for 47 minutes). Start checking at 1 hour and bake until done, whatever that means in your oven and with your pans, until a toothpick comes out clean or with a few moist crumbs but no batter. Do not overbake. Allow cake to cool in pan for about 30 minutes before inverting it onto a serving platter to cool completely. Glaze – To a small bowl, add the confectioners’ sugar, milk, and whisk to combine. Evenly drizzle the glaze down the sides of the cake before serving. Cake will keep for up to 5 days at room temp. I am comfortable storing glazed items at room temp but if you are not, store in the fridge, noting the cake will be more prone to drying out. 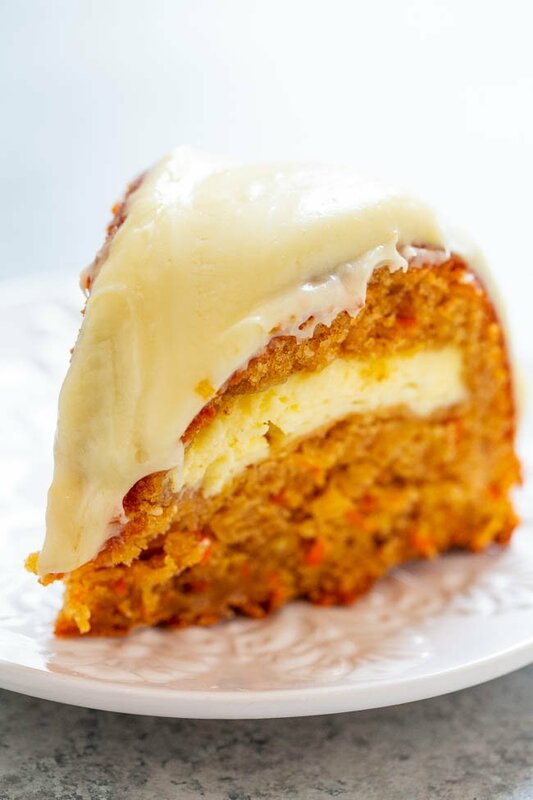 Carrot Apple Cream Cheese Tunnel Cake with Cream Cheese Frosting – If you like carrot cake, you’re going to LOVE this version that includes apples and a tunnel of cream cheese that runs through the center!! EASY, amazing, and a MUST-MAKE!! 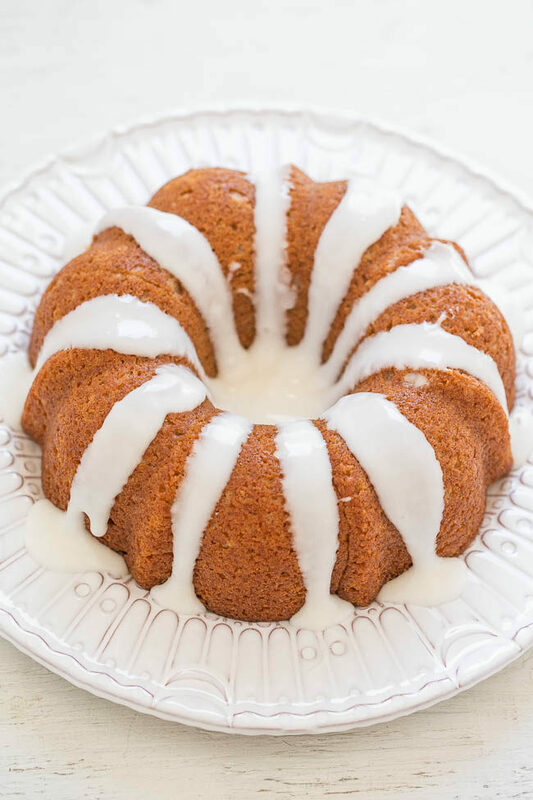 Glazed Cinnamon Roll Cake – The flavor of cinnamon rolls in a soft, tender, EASY cake!! One bowl, no mixer, and you’re going to love the tangy-sweet GLAZE!! Love how simple all of these ingredients are, not to mention how moist and dense the cake looks! I HATE dry cakes. I hate dry cakes too! This is one of the moistest pound cakes I’ve ever tried! I don’t see cream on the ingredient list. Am I missing something? ‘Cream’ is a verb in baking in this sense, not an ingredient. This does look very good and moist. I am a bit confused though. How will the batter fit in a 10 cup tube pan but not a 12 cup bundt pan? Would the 12 cup not hold more batter? Can you add blueberries to this cake? I haven’t tried so cannot say for sure what they would do to the batter when they release their juices during baking. Ok! I was just curious about it. Ha!! OMG! Made this tonight and it was the BOMB! I only had to cook it for an hour so please watch it. Cake is fluffy, moist and you can really smell the almond. My entire mixture went into my pan. Had to add some more milk to my glaze…one tbsp was definitely not enough. Top notch recipe for sure!!!! Thanks for a 5 star review and glad that the cake is the bomb for you! Oh my goodness… Finally a recipe off the Internet that actually taste good and works! I’m not a big poundcake fan, I made this for my husband, and oh my goodness is it fantastic. When you talked about all the legwork you did, over the years, to create a good cake, I thought Hmmmm, here is a recipe to try. Everything was extremely accurate, thank you so much for sharing this recipe with us.. You now have an avid follower! Thanks for the 5 star review and glad everything was extremely accurate and that you will now be an avid follower!